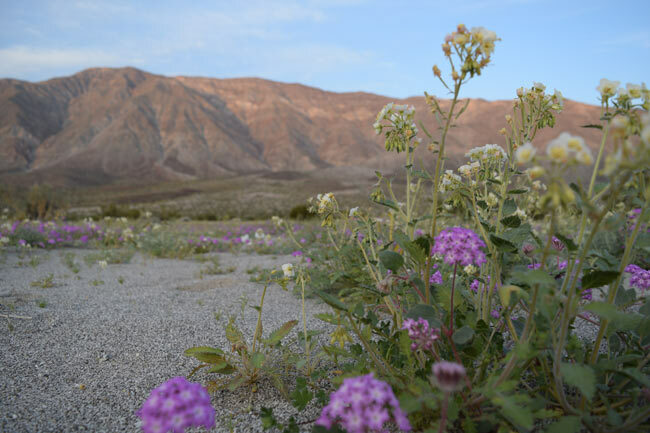 For the past two years now — and for the first time in nearly thirty years — we’ve had Super Blooms in our California deserts. You see, it takes more than rain to make a Super Bloom. The rain has to fall at exactly the right time, in exactly the right amount and at exactly the right intervals. There has to be sufficient rain in the Fall to soften the hulls of the seeds so the flower inside can sprout. Then the temperature in the following months has to be just right — a sudden hot spell and the seeds are fried before they sprout. And a rainy year for part of California doesn’t guarantee rain everywhere. When I was in Joshua Tree National Park, they were bemoaning that they didn’t get the rain that the Mojave National Park did not that far away. Even if all the conditions are right, hitting the brief bloom at just the right time is almost impossible. 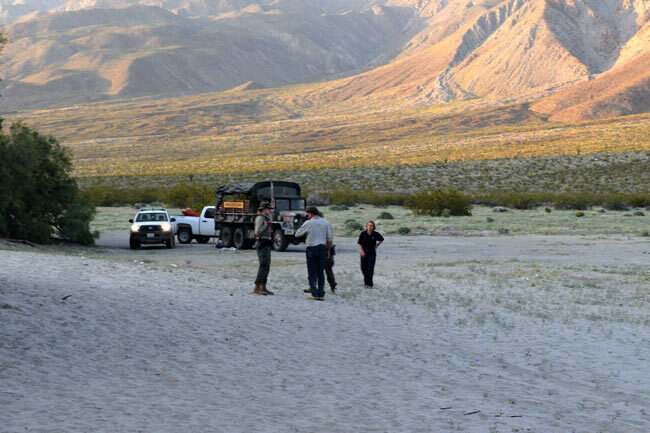 For last year’s Death Valley Super Bloom, I didn’t anticipate it far enough in advance and by the time it was happening, every lodging for miles around was booked. I found a motel 50 miles away, rushed down, only to arrive after a windstorm had decimated half the flowers. This time, all my stars were in alignment. 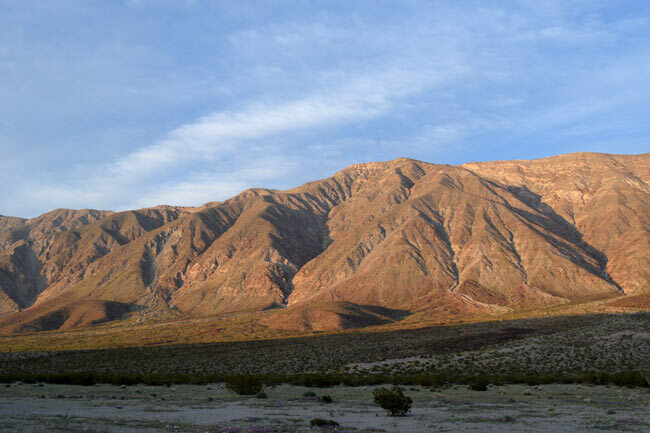 I got a campsite reservation right beside the park, I got myself down to Anza-Borrego Desert State Park and BAM! I hit the peak of the bloom. 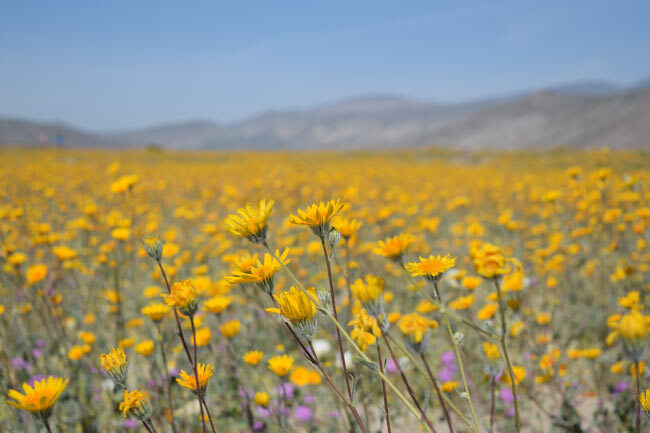 As a student of desert and semi-arid ecosystems, I need to qualify Super Bloom. Because judging from some of the negative comments I’ve seen on TripAdvisor and Yelp, some people are not doing even a minimum of reading on what they can expect to see. 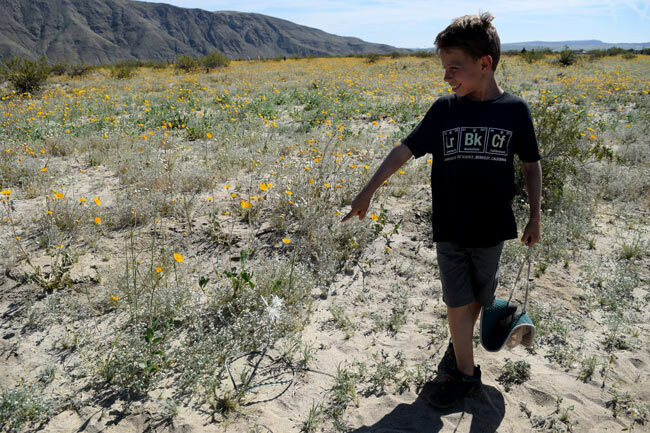 Here’s the thing, even in a Super Bloom year, the desert is still the desert. It’s not going to be like the tulip fields in Holland. The flowers will be small, tough, and spaced apart so you can still see the sand. There will be some areas where you will see acres and acres of flowers. These will be areas, that in a less arid place, would be meadows. Say, a flat or concave area at the foot of a mountain or hill so it gets extra water run-off. The flowers you see here will be the least spectacular: Desert Sunflowers, Lupines, Desert Poppies. 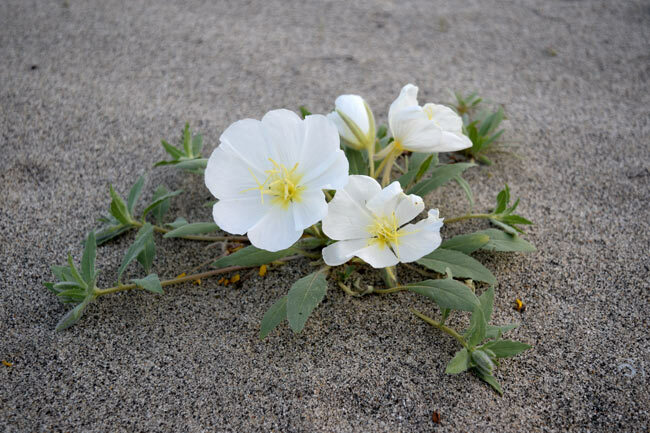 These are flowers that scatter a lot of seeds, so they generally bloom in greater quantities than other desert plants. What will be spectacular in a Super Bloom year will be that there will be millions more of them than usual. But the most beautiful and rarest flowers will have to be scouted out as they usually grow in more remote and less accessible areas. Even in Super Bloom years, there will be few of them. 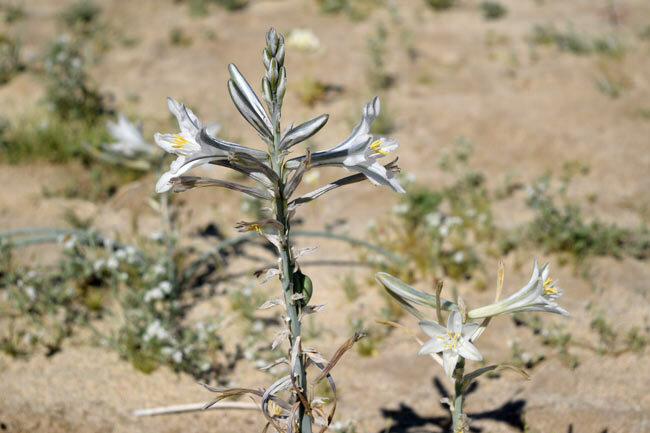 These are the flowers that a good guide outfit — and California Overland is an excellent one — can lead you to. You can see how this bowl surrounded by mountains would funnel what little water there is down onto the canyon. So that’s where the greatest number of flowers will bloom. Another thing you must do is find an 8-year-old. This is Elliot. 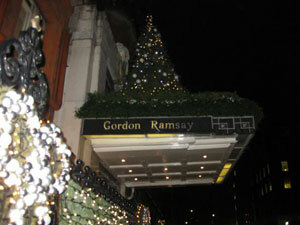 I was lucky to meet him. He was an excellent caterpillar spotter. These caterpillars were gorging on flowers. You could see them chomp one down just while you watched. 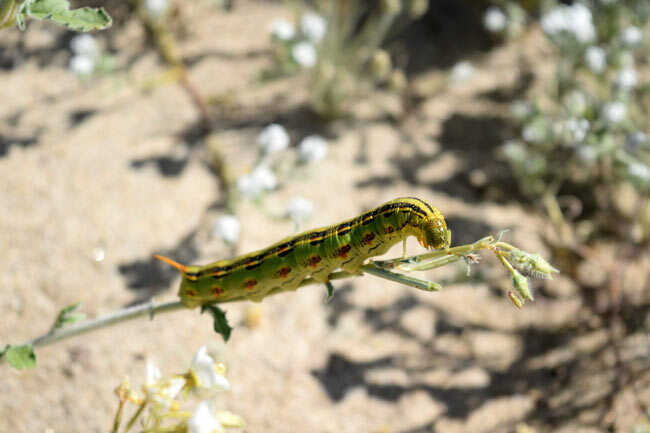 But they are a favorite snack of Swainson’s Hawk, so not many get to grow into Sphinx Moths. Circle of Life. 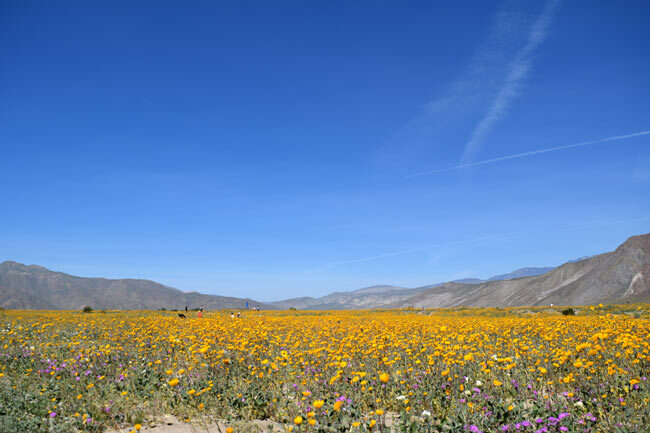 So in the case of this Anza-Borrego Super Bloom, the masses of flowers were all in Henderson Canyon about a mile from the center of the tiny town of Borrego-Springs. I drove out in my RV, pulled over to the side of the road and walked through the meadows. If all you want to see are flowers, you can do that tour easily on your own. If you want to really see the desert or see the rarest plants, that’s when you hire a guide or an outfitter. They will get you off the beaten path and to inaccessible areas. This is no mean feat. California Overland packed us into Army surplus all-terrain troop carriers that looked to be circa Desert Storm. Once you get off one of the only two paved roads in Anza-Borrego, it’s all dirt track, dry washes and climbing over boulders. And when you get up into the Badlands, the flowers thin out. What you should be looking for and enjoying at this point is the geology, the terrain and those rare flowers that you will find growing in the most inhospitable places. On my second trip with California Overland, I opted for a sunset and stargazing trip. I know the flowers are the main attraction right now, but, besides the geology, the play of light and the clear dark skies filled with stars are the main reasons to go to the desert. Remember, even when the flowers fade, even in the driest of dry years, you can still experience that. 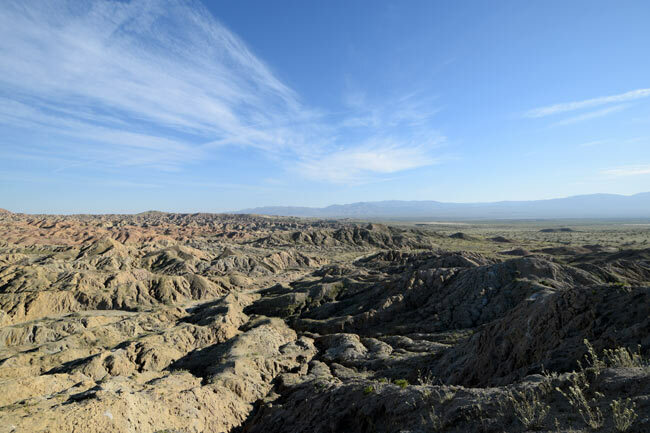 Looking over the Badlands of Borrego. We drove over country just about this rugged and arrived with most of our fillings. The Badlands are some of the most fossil rich areas in America. The area was a plateau lifted up then eroded down. Apparently, the paleontologists who work this area don’t even have to dig. They just scout through after rains and see what Mastadon tusks are poking through the dirt. As stunning as the flowers is the play of light on a desert landscape. This you can see in any year. The area is also one of the most seismically active areas in America. Our guide, Joe, told us an eerie story. He’d come out to this area with friends one night to watch the Perseid meteor shower. Suddenly they saw a long horizontal flash of light that looked to be about a mile long. Then vertical waves started shimmering up out of it. Later, when Joe talked to a geologist friend, he told him some scientists theorize that there are gasses emitted when a fault line ruptures and that might account for the light. Even stranger, Joe was scouting around looking at petroglyphs with an archeologist friend and saw a design that showed a horizontal line with vertical lines coming out of it. The archeologist said he’s seen that same design in petroglyphs all over the area. Joe is convinced the ancients were charting the same phenomenon he had seen. Then, just as we’d set up our camp chairs preparing to eat dinner while watching the sunset and stars, a group of rangers showed up. Turns out a small plane had gone down somewhere near us a few hours before, but the pilot was nowhere to be seen. The rangers thought he’d walked away and was maybe disoriented and dehydrated in the 95 degree heat. We never did hear if he had been found and he didn’t stumble into our camp as we ate our picnic dinner. But the experience did underscore another good reason not to go exploring out in the desert without a professional guide. 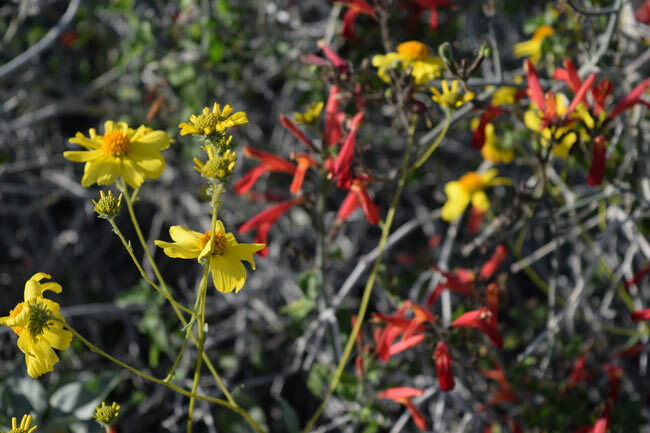 Off the beaten path, you see desert flowers thriving in the harshest of environments. Even out in the Badlands, we found flowers. They’ll probably fade much faster here in this harsher area. In summary, go see the flowers. Their time is fleeting and it may be 30 years before we see a bloom like this again. But remember all the other beauties and wonders the desert can offer. Just be careful out there! My husband towed his mobile observatory to the AB state park Visitor center on Sat night and did a Star Party for the folks there. He has done that each month since November. He said it was crazy this weekend. There is no easy way through the LA basin. We even tried the Bakersfield/Barstow route once. But, we prefer the 101 to the 210 over all. We live in San Diego and will be using that route yet again this summer as we trek north to Oregon for the solar eclipse. We know the campgrounds on 101 very well and we prefer the cooler route. Plus, if we get really lucky, we can snag an ocean campsite for a night or two. We’ll see. Perhaps we’ll see you down the road. Happy travels! Great photos, loved them all. Thanks as always for taking us along! Sandy, maybe I will see you. I’ve been toying with a summer trip up to Oregon. I did the coastal route once before but I’d like to see Crater Lake again, swing by the Malheur, and I can’t pass up something like an eclipse.